Next came the real surprise, this so called economy Blue Motion version, has such a spirited all round performance. The 2.2-litre 4-cylinder engine delivered a real punch albeit in a velvet glove and that potency was all the more enjoyable as the handling factors proved so light yet responsive, the handling more that of a sporty hatchback, the braking system well in command and the selectable automatic 7-speed transmission willingly dancing to the engine’s tune. Importantly, there is an excellent blend of confident handling. a compliant ride and low noise levels, created to a good degree by the choice of the medium profile Pirelli tyres that are probably the ideal formula for this type of car without compromise. This experience of what, for a Mercedes-Benz brand model, is a fairly innocuous looking car when compared with the serious racy looking cars bearing the famous three pointed star insignia perhaps bears out Mercedes-Benz report that it took top spot in the premium brand sales figures for the UK in February and that the success was strongly bolstered by a very healthy upsurge in demand for its estate models, both C and E Classes. It is a long time since I used the term ‘a wolf in sheep’s clothing’ or even a ‘Q car’ but here I was driving a car that one presumed would be owned by a sagely minded driver perhaps with a need to carry five occupants (not necessarily a family) in good comfort and some luggage or from time to time a load of promotional or lifestyle items. It would undoubtedly be one who obviously also appreciates the status and qualities of the make though hardly strongly swayed by sporty performance. There’s more than enough here to bring a smile to any driver’s face! Whoever gets behind the wheel of this particular Mercedes-Benz estate I suggest will become a seriously discerning driver if they are not already, the liveliness has to be experienced to be believed. Mercedes-Benz claim a top speed of 136 mph and an ability to reach 62 mph (100 kph) from rest in a very competitive 8.3 seconds while returning an extra urban fuel consumption figure of 65.7 mpg - perhaps in real world terms and with a bit of a load on board still around 48 mpg and that’s sensible. What really makes me feel at home in this car is the seriously comfortable driving position that has power memory adjustment, the easy on the eye fascia with the clear faced instrumentation, including a digital KPH reading in place of some of the miserly small markings used on some rival’s instruments, the easy hill-hold electronic parking brake and, of course, the high standard of interior furnishing that is based on a tasteful blend of carbon fibre, bright metal, quality plastics and leather upholstery. Such qualities that cleverly combine to create a traditional Mercedes-Benz feel good factor. Of course, this car comes seriously equipped and with an options menu that should suit pretty well all requirements based on a range of packages covering security and safety, communications and in-car entertainment plus some practical items like a load securing kit, towing kit and storage boxes under the front seats. And, at least, there is a space-saver spare wheel. Above all, practicality is a strong factor, the floor to the usefully sized/proportioned luggage area is low and the rear seats 60/40 split fold and there are fittings for optional roof rails. I can see a lot of reasons for choosing this Mercedes-Benz estate car, some may well be obvious, others are pleasantly surprising! 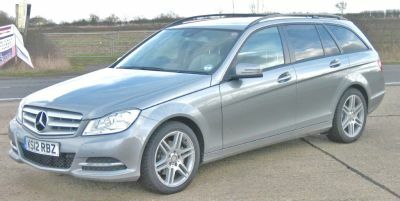 Rivals include Audi A4 Avant, BMW 3 Series Touring, Jaguar Sportbrake, Volvo V70, VW Passat Estate.